The most decadent, with added cream and a loose pressing to allow all of that amazing sweet and salty Roquefort blue do its thing. The wax has an effect on the cheese as it ages to keep things really nice and creamy. If you are a lover of blue cheeses and generally gravitate to the funkiest thing in the room, this is your cheese! Smoked over applewood for 20 minutes. Farmhouse-style cheese with a tiny kiss of Roquefort, just to give it a floral and earthy note on the rind. Added cream creates a level of decadence that carries the experience from start to finish. Light and airy with a briny finish. Non-traditional take on "Tomme" or French farmer's cheeses. Traditionally made with skim milk, ours is made with our double-creme Brie curd for a decadent and buttery mouth feel. Cooked and pressed, it has a firmer texture and a slight tanginess up front. 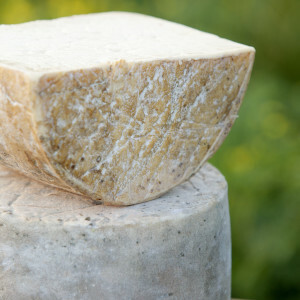 We age this in our white cave, and as it begins to develop a white wooly rind, we start washing back that with various ales. Using our Gouda recipe as a starting point. The base stays creamy, and we let the curd stay slightly more open than our regular Gouda to allow the tiny little crystalline delicious flecks of blue migrate throughout thewheel. A piercing process creates further developement and finally the wheels are put to rest for roughly 60 days in our Blue Cave.